Travis Richard Shaw (born April 16, 1990) is an American professional baseball infielder for the Milwaukee Brewers of Major League Baseball (MLB). He previously played for the Boston Red Sox. Listed at 6 feet 4 inches (1.93 m), weighing 225 pounds (102 kg), Shaw bats left handed and throws right handed. His father, Jeff, is a former two-time All-Star pitcher who played for six major league teams. Shaw was born and raised in the city of Washington Court House, Ohio. Shaw attended Washington High School, the alma mater of his father, Jeff, a former MLB closer who was a two-time All-Star who played for six major league teams during an 11-year career. Travis Shaw played college baseball at Kent State University in Kent, Ohio. He batted a .307 average with a Mid-American Conference-leading 14 home runs while playing 62 games for the Golden Flashes in 2011. He also slugged .553 and collected 51 runs batted in, being named to the first team All-MAC in 2011 and the second team in 2010. Shaw also played in the Cape Cod Baseball League for the Bourne Braves. The Red Sox selected Shaw in the ninth round of the 2011 MLB draft and he made his professional debut that year with the Short-Season A Lowell Spinners, leading them in RBI (36) and ending second in doubles (14), home runs (8) and runs scored (34). On July 2 of that season, he set a team record for the most total bases (12) in a single game, after going 4-for-4 with a home run, three doubles and two walks, driving in five runs while scoring three times. He finished the year at Low Class A Greenville Drive, batting .333 in two games before gaining a promotion to the High Class A Salem Red Sox in 2012. Shaw had a breakout season at Salem, hitting .305 with a .411 on-base percentage in 99 games, while leading the team in home runs (16), RBI (73) and runs (69), being named to the Carolina League mid-season All-Star team. He was promoted to the Double-A Portland Sea Dogs early in August, but was strongly tested in the upper Eastern League, where he finished with a .227 average, three home runs and 12 RBI in 31 games. Even so, he was among the five best Red Sox minor leaguers in 2012, ranking second both in RBI (85) and OPS (.918), fourth in slugging (.519), while tying for second in on-base percentage (.399) and for fourth in home runs (19). In 2013 Shaw scuffled while adjusting to Double-A, hitting a paltry .221 in 127 games with Portland. Nevertheless, he finished with 16 home runs, 50 RBI and a very solid .452 OBP. Then, during the offseason he had a chance to play against some of the best prospects in baseball in the Arizona Fall League, where he hit a .361/.452/.705 line with five home runs and 19 RBI in 17 games for the Surprise Saguaros team. Shaw steadily progressed in 2014, while splitting time between Double-A and Triple-A. He hit .305/.406/.548 with 11 home runs and 37 RBI in 208 plate appearances for Portland before gaining a promotion to the Triple-A Pawtucket Red Sox. He finished strong at Pawtucket, hitting .262/.321/.431 with 10 home runs and 41 RBI in 81 games. Overall in 2014, Shaw topped the Sox minor league system with 21 home runs and collected 78 RBI, being surpassed only by Carlos Asuaje (101). He also scored a second-best 78 runs behind Mookie Betts (87) and was second in extra base hits (52) to Asuaje (65), while improving his approach from 2013. As a result, Shaw walked more than he struck out in Portland (29-to-23) and posted acceptable strikeout (76) and walk (28) rates at Pawtucket. Shaw ranked 19th in the MLB.com Top 20 Boston Red Sox Prospects list for 2014. Shaw was added to the 40-man roster in November 2014. He was promoted to the major league club on May 8, 2015, making his major league debut on the same day against the Toronto Blue Jays. He was optioned to Pawtucket the next day. On July 7, 2015, Shaw was called up from Triple-A Pawtucket and recorded his first major league hit, a second inning single against the Miami Marlins. Shaw went 3-for-4 on the night with a run scored. On August 1, Shaw hit two home runs, went 4-for-4 with a walk, and was a triple shy of hitting for the cycle. 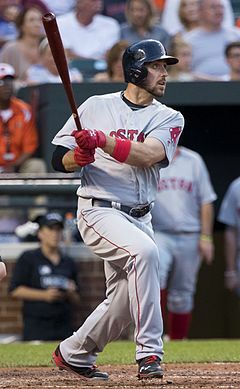 Two weeks later, in Boston's 15–1 rout of the Seattle Mariners, Shaw went 3-for-5 with two home runs, his second career two-homer game. Shaw became the second MLB player to have a pair of two-homer games in the first 18 games of his career. During spring training in 2016, manager John Farrell stated that there would be open competition for the starting third baseman's job between Shaw and the struggling Pablo Sandoval. After slashing .338/.394/.492, Shaw was named the Opening Day starting at third base. During his time in Boston, Shaw was nicknamed "Mayor of Ding Dong City". He appeared in 210 games with the Red Sox, batting .251 with 29 home runs and 107 RBIs. On December 6, 2016, the Red Sox traded Shaw, Mauricio Dubón, and Josh Pennington to the Milwaukee Brewers for Tyler Thornburg. On April 3, 2017, Shaw was the starting third baseman, making his Brewers debut on Opening Day against the Colorado Rockies. He went 2-for-4, hitting two doubles, including an RBI double, and striking out twice. Shaw went on to have a tremendous season with the 2017 Brewers, batting .273, with 31 home runs and 101 RBIs, along with 10 stolen bases in 144 games played. In 2018, Shaw appeared in 152 games with the Brewers, batting .241 with 32 home runs and 86 RBIs. Following the Brewers' acquisitions of Royals third baseman Mike Moustakas and Orioles infielder Jonathan Schoop in late July, Shaw shifted primarily to second base while also logging innings at first base. In the postseason, he batted 4-for-11 (.364) in the Division Series with one RBI. Shaw married Lindy Berry in 2012. The couple welcomed their first child, a daughter named Ryann, on June 5, 2017. Ryann was born with hypoplastic left heart syndrome and required two open heart surgeries on June 9 and June 10. She was released from the hospital, after nearly four months, shortly after the Brewers' season ended. Shaw is the son of former All-Star closer Jeff Shaw. ^ a b "MiLB.com – Travis Shaw profile". ^ a b c d e "Sox-Prospects.com – Travis Shaw page". ^ a b "2014 Red Sox Minors Hitting Statistics (Overall)". ^ Doyle, Ricky (November 20, 2014). "Blake Swihart, Three Others Added To Boston Red Sox's 40-Man Roster". NESN.com. Retrieved April 6, 2017. ^ Cox, Zack (July 8, 2015). "Red Sox Notes: Travis Shaw Breaks Out; Koji Uehara Joins Exclusive Club". NESN.com. Retrieved April 6, 2017. ^ Doyle, Rick. "Travis Shaw Hits First Two Big League Homers In Red Sox's Win (Video)". nesn.com. Retrieved October 1, 2015. ^ Carlton, Jimmy (December 7, 2016). "Who is new Brewer Travis Shaw and why is he "Mayor of Ding Dong City?"". onmilwaukee.com. Retrieved September 23, 2017. ^ Drellich, Evan (December 6, 2016). "Red Sox trade for Brewers reliever Tyler Thornburg". www.bostonherald.com. Retrieved April 6, 2017. ^ Armas, Genaro (April 3, 2017). "Rockies win in debuts of Black, Holland, beat Brewers 7-5". AP News. Retrieved April 6, 2017. ^ "Father's Day has extra meaning for Shaw". MLB. Retrieved December 21, 2017. ^ "With baby daughter out of hospital, Brewers' Travis Shaw reflects on life-changing year". Journal Centennial. Retrieved December 21, 2017. This page was last edited on 14 April 2019, at 06:26 (UTC).